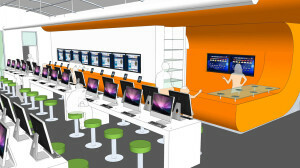 An artist’s rendering shows computer stations at the new BiblioTech bookless public library. 19-year-old Abigail Reyes, at the newly opened BiblioTech – a first of its kind digital public library in San Antonio, Texas. Bexar County’s BibiloTech is the nation’s only bookless public library, according to the American Library Association.